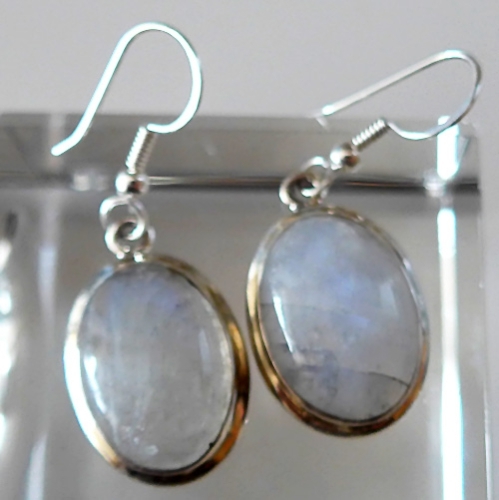 These lovely sparking Blue Flash Moonstone Earrings are from India. They are set into sterling silver with a defined bezel setting and hang off of sterling hooks. These are very pretty earrings for a great price. 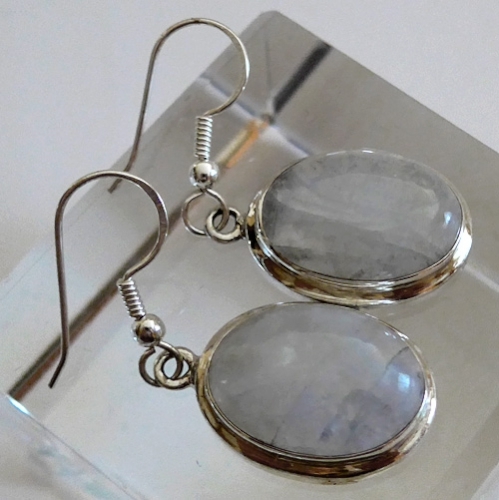 These Moonstone Oval Hanging Earrings have a blue shimmering reflective sheen that gemologists call "blue adularescence." This means that the Moonstone shines with a spectral lustre that flashes blue in different lights, or as the gemstone is rotated in the line of sight. The Moonstone Isis produces a wavy multi-colored band of light; like a cat's-eye, with rays ranging from pearly white to violet to electric blue. The white and violet shimmer produced by this Moonstone pair indicates this gemstone's resonance with the crown chakra, which is considered to be violet or gold in the Western chakra system. The blue flash present in the stone indicates a connection with the throat chakra. It has also cleaned and charged with the natural energy of sunlight. It is ready for you to program according to your own needs and desires. We know you will use these powerful crystals with loving wisdom and respect its journey in the Earth for many long historical cycles which has developed its unique metaphysical properties and beautiful appearance. Check out the article "Using Quartz Crystals in Digital Technology, Healing and Meditation" for an overview of the metaphysical and mineralogical properties of quartz, and a step-by-step guide explaining how to cleanse, charge and program quartz crystals for healing, meditation and other spiritual purposes. See our Spirits of Stone free ebook online. Note: weight above is shipping weight. Average weight is 10 gms for the two earrings. Each set of earrings is unique & may vary somewhat in appearance, size & inclusions. Each pair is guaranteed to be beautiful & to meet with your complete satisfaction.